Bullying can be found in every school system, school, and classroom. It is destructive to the well-being of students, creates unsafe schools, and impacts learning. School personnel, parents, and others are increasingly realizing the importance of putting effective anti-bullying strategies and policies in place that will create safe, caring, and peaceful schools where all students feel a sense of belonging and acceptance. 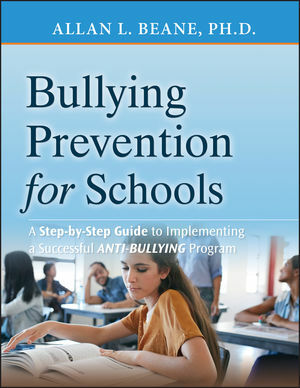 Based on Allan L. Beane's proven Bully Free7reg; Program, Bullying Prevention for Schools is a step-by-step guide to implementing an anti-bullying program in individual schools or throughout a district. Bullying Prevention for Schools also contains a wealth of reproducible documents and forms, such as surveys, statement sheets, and intervention questionnaires. Allan L. Beane, Ph.D., is an internationally recognized expert, speaker, trainer, and author on the subject of bullying with more than 34 years of experience in education. He is the author of several anti-bullying books and resources, including Protect Your Child from Bullying from Wiley. For more information, visit www.bullyfree.com. Step 1 Establish and Train the Bully Free Program Team and Develop the Program Time Line. Step 2 Provide Bully Free Awareness Training for School Personnel and Volunteers. Step 3 Provide a Bully Free Awareness Assembly for All Students. Step 4 Provide a Bully Free Awareness Presentation for Parents and the Community. Step 5 Develop a Program Evaluation Plan and Determine the Status of Bullying in the School. Step 6 Develop the Bully Free Program Mission Statement, Objectives, Slogan, and Logo. Step 7 Implement a Bully Free Curriculum. Step 8 Develop and Implement the Bully Free Program Administrative Strategies Plan and Policies. Step 9 Establish the Bully Free Rules and Behavioral Expectations. Step 10 Develop the Discipline Rubrics and Adopt Prosocial Strategies. Step 11 Develop the Response Plan. Step 12 Identify the High-Risk Locations and Times and Develop and Implement a Coordinated and Monitored Supervision Plan and Schedule, as Well as a Reporting and Information Exchange System. Step 13 Train School Personnel, Volunteers, and Other Key Individuals to Adhere to Policies, Procedures, Discipline Rubrics, Prosocial Strategies, and Response Plans. Step 14 Conduct a Meeting with Adults and an Assembly Program for Students to Increase Awareness and Encourage Involvement. Step 15 Develop and Implement a Student Involvement and Empowerment Plan. Step 16 Develop and Implement Parent and Community Involvement and Education Plans. Step 17 Review and Confirm the Implementation and Completion of Program Components and Activities. Step 18 Readminister the Survey Instruments, Analyze Pre- and Post-Data, and Make Improvements. Step 19 Celebrate Success and Plan for Next Year. Appendix A: Description of the Bully Free Program-Handout. Appendix B: Overview of Bullying-Handouts and Fact Sheets. Appendix C: Bully Free Survey Instruments. Appendix D: Sample Antibullying Policy. Appendix E: Bully Free Rubrics and Blank Rubric Forms. Appendix F: The Bully Free Response Plan Forms for Students Bullying Students. Allan Beane's Bully Free Program Dr. Beane provides the background, advantages, and process for implementing the Bully Free Program in schools and districts with parental and community involvement.